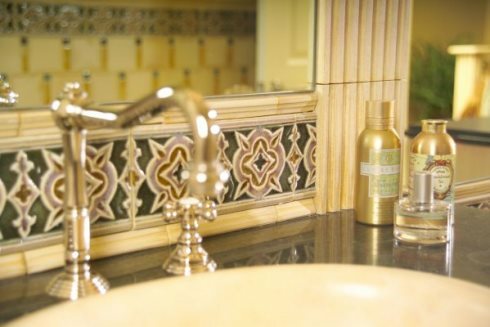 The bathroom tile designs featured here use contrasting colors, patterns and textures to achieve dramatic results. Richly moulded ceramics exude Old World elegance . . . while undulating waves of glass impart contemporary cachet! Sharply contrasting colors, deep mouldings and high relief patterning lend timeless elegance to a tile design from Encore Ceramics (below). 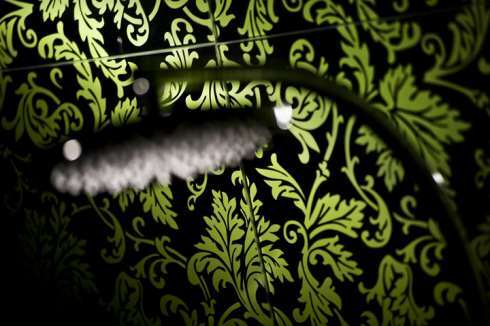 The "Vecchio Collection" evokes classic motifs from the legendary hills -- and homes -- of Tuscany. 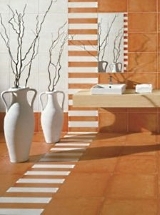 Pictured below is a shower tile design from Italian manufacturer, Vetrocolor. 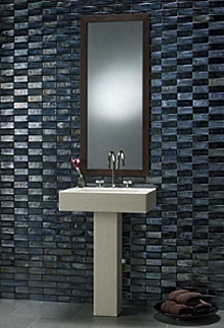 The sleek and stylish glass tiles feature a lush climbing vine pattern on a dark background. Radiant in color, the organic forms have an almost iridescent quality. 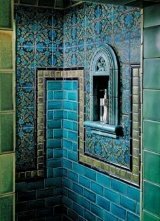 Among the leading mosaic tile producers in North America, New Ravenna, based in Exmore, Virginia, creates intricate patterns with vibrant hues and lustrous finishes that are nothing short of extraordinary. 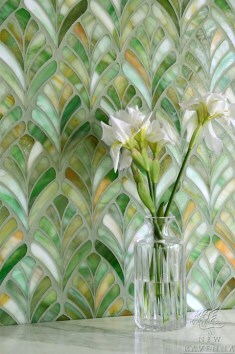 Pictured below, left, is "Margot," a jewel glass waterjet mosaic shown in Emerald. 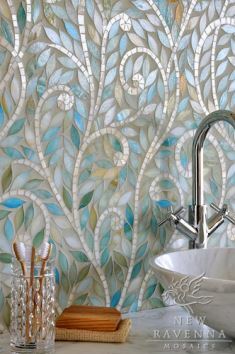 "Climbing Vines," another of New Ravenna's jewel glass waterjet mosaic tile patterns (below right), is shown in Aquamarine leaves and Quartz vines. 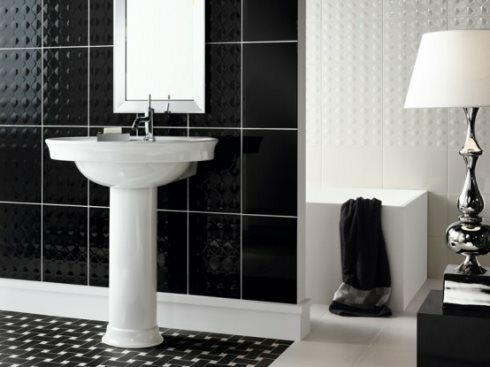 The bathroom tile designs that follow offer a glimpse into the limitless looks that can be created with black and white tiles, alone (well, almost alone...2 out of 3 in this case). 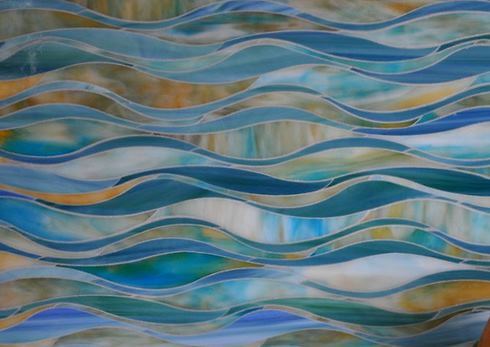 Pictured below, left, is a design by Sara Baldwin for New Ravenna Mosaics. 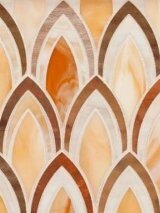 Crafted from stone, employing waterjet technology, "Tamara" features a bold decorative pattern with stylized oak leaves. 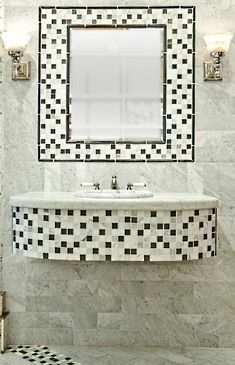 Accentuating the contrast in colors are contrasting finishes -- honed, or satin (black), and polished (white). 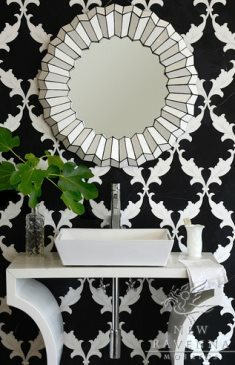 Low-relief bathroom tile patterns lend textural variety to a clever juxtaposition of black and white, classic and contemporary, in a ceramic and porcelain tile design from NovaBell's "York" series (below). 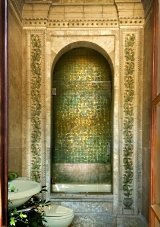 A mosaic tile floor simultaneously complements and counterbalances the large rectangular wall tiles and, in the process, provides yet another striking "layer" of contrast. 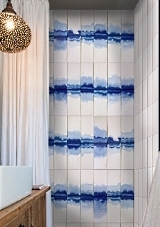 Undulating patterns of gently rolling waves calm the senses in the bathroom tile designs that follow. Their soothing lines and subtle color contrasts evoke a spa-like ambiance. 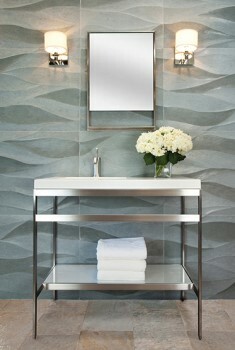 Pictured at right is a design from the "Ambra" collection by Artistic Tile. It features finely sculpted three-dimensional stone tiles with both matte and polished finishes for added depth and contrast. 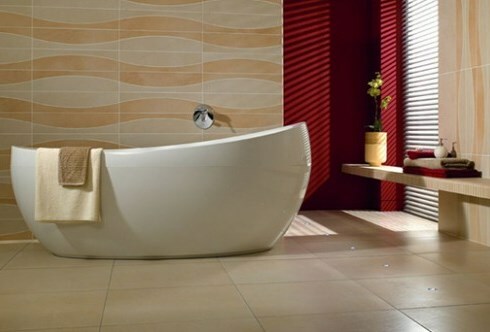 The sleek and chic bath design below features porcelain stoneware tiles from the "Bernina" series by Villeroy & Boch. Finished to resemble quartz, each tile is 15 x 60 centimeters (approx. 6 x 23 inches) in size. 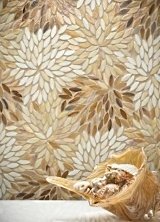 And last -- but far from least -- is "Oasis," a stunning jewel glass mosaic created by Sara Baldwin for New Ravenna. Shown in Peacock Topaz and Aquamarine, the sublime wave-like forms appear to flow in a sea of serenity! 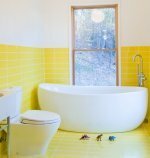 Please check back often or subscribe to our RSS feed, as we frequently add new bathroom tile designs to our site.